Morgan is the 16-year-old daughter of Ben and Lynn Watt of Ashville. She is a junior honors student at Penn Cambria High School. Morgan has been show­ing livestock at the Cambria County Fair for 9 years. She was the 2016 Premier Stock­man champion and has won the hay stacking twice with the help of the best farmers in Cambria County. She has served as the President of the Cam­bria County Beef and Veal Community 4-H club for the past 2 years. She is a member of the Cambria County Livestock Judg­ing Team. Morgan competes on the High School and YMCA swim teams. Her other interests include hunting, fishing, hik­ing, and farming. She is employed by Valewood Dairy and the Cresson Lions Pool. Morgan plans to continue her agricultural experiences by attending Penn State University and earning a degree in animal science. Rayn is from East Taylor Township, Johnstown, PA. She is a senior at Conemaugh Valley High School. 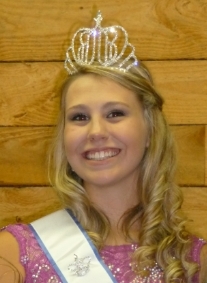 She competes on the 4-H Archery team, high school swim team and cheerleading squad. She is a member of the South Ebensburg 4-H Club and won first place at the Penn State 4-H Achievement Days two years in a row for women's compound archery. Rayn plans on attending The University of Pittsburgh earning a doctorate of pharmacy degree. Tatianna is the daughter of Ray and Janalee Schilling of Blacklick Township, is a graduate of Blacklick Valley High School. She is the president of the Hoof, Feather and Hare 4-H club. She is the 2014 recipient of the Zachary Alvarez Memorial award. Tatianna is a lifetime member of the American Border Collie Association, Blue Goose Sportsman Club and national Swine Registry. She is currently studying at UPJ majoring in Civil Engineering. Alyssa is the 19 year old daughter of Andy and Cathy Wills of Dysart. She currently attends Mount Aloysius College for Criminology. With this degree, she plans to attend the Pennsylvania State Police Academy. At the Mount, she is a member of the soccer and softball team. After 11 years of 4-H showing swine, sheep, goats and rabbits she is continuing to exhibit at the fair with several Ag building entries and with her horse Serra. Chelesy of Gallitzin, is the daughter of Tammy Driskel. She is 17 years old and attends Penn Cambria High School. 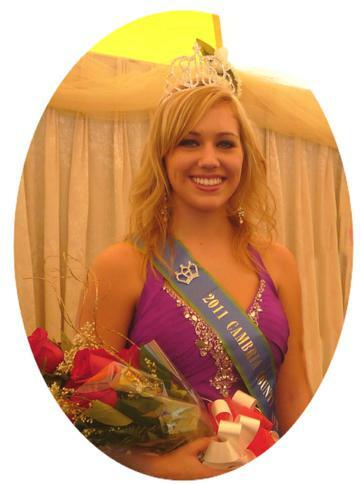 Her scholastic achievements include: National Honor Society, Penn Cambria Honor Roll, and Penn Cambria Honor Programs. At Penn Cambria, she is an active member of the Key Club, German Club, Creative Arts and Theatre Club, Student against Destructive Decisions, Prom Committee and the Speech League Team. Chelsey plans to pursue a degree in psychology and then further her education by attending Law School. 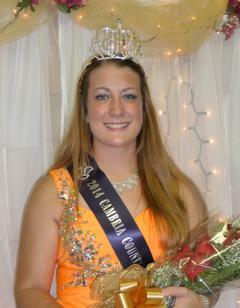 Julie is the 19 year old daughter of Robert and Barbara Veneskey of Carrolltown was crowned the 2012 Cambria County Fair Queen. During Julie’s ten years in 4-H, she was involved in the 4-H Farming Friends, and Kids of the Mountain 4-H Goat Julie currently attends IUP where she is seeking a nursing career. 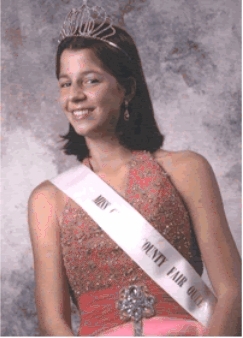 Taylor is the daughter of John and Kathy Akers of Johnstown, PA. She is a student at Bishop McCort High School. Taylor volunteers for events at the St. Benedict Parrish and Richland Community Days. Gabbi of Cresson is the 19 year-old daughter of Jeff and Annette Hertzog. She is majoring in Elementary Education with a concentration in Middle School English at Mount Aloysius College. Gabbi coaches a speech league team for 6th, 7th, and 8th graders at Saint Michael School in Loretto. Gabbi is active in community theatre, having completed her 20th show at Cresson Lake Playhouse as Sarah Brown in "Guys and Dolls." 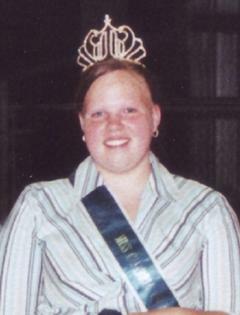 She was also the 2009/2010 Cambria County Dairy Princess. Janelle of Dysart is the daughter of Andy and Catherine Wills. She is a student at Cambria Heights High School. Her scholastic achievements include: National Honor Society, Cambia Heights High Honor Roll, Cambria Heights Outstanding Academic Achievement Award, National Honor Roll and Cambria Heights Gifted Program. She is an active member of St. Joan of Ark Church volunteering at the Church Festival. She is a member of the Cambria County 4-H Livestock Judging Team, 4-H Clover Club showing swine, goats, and lambs, Vice President 08, President 09, Cambria County 4-H Teen Council 2008 Vice President 08, President 09, Participant in the Pennsylvania Farm Show, Member of the Pennsylvania Club Livestock Association (PCLA) and Participant in PCLA Pro Shows. 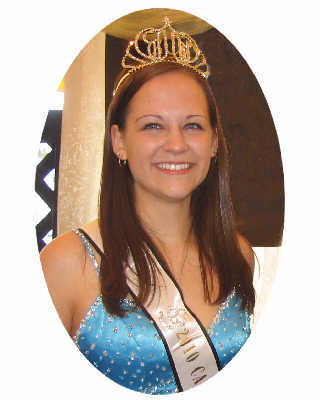 Emily of RD Ebensburg is the daughter of John and Mari Anne Drahnak. She is 19 years old and attends the University of Pittsburgh at Johnstown. 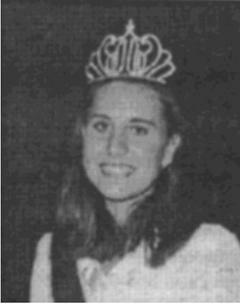 Her scholastic achievements include University of Pittsburgh at Johnstown Deans List, National Honor Society Treasurer and Outstanding Young Women’s Scholarship Competition Contestant. She is an active member of Holy Name Parish volunteering at annual festival and church activities, Member of the UPJ Dance Ensemble, UPJ Orientation Leader, Assistant instructor at Lee Malloy’s School of Dance, and Student Math tutor at Ferndale Elementary School. She plans to pursue a career in Elementary Education and to further her education by obtaining a Masters degree in Reading in order to become a reading specialist. Emily is the daughter of Kathy and Terry Yarnish of Lilly. She is 16 years old and attends Penn Cambria High School. 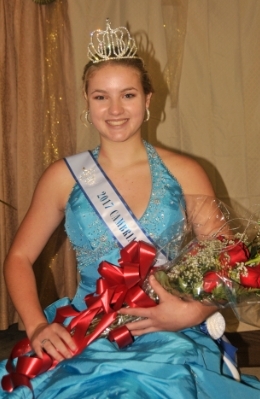 At Penn Cambria she is a cheerleader and is a member of Who's Who Among American High School Students. She is a member of the South Ebensburg Community Club where she has held many offices and is currently president. 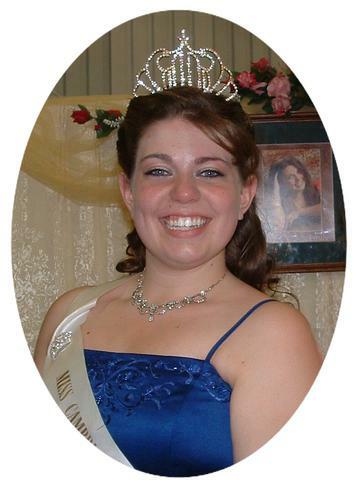 She has been a 4-H camp counselor for two years and participated in the 4-H Achievement Days in public speaking. In her community, she helps out with her church bible camp and volunteers with the Lilly Area Ambulance where she plans to pursue EMS Training. 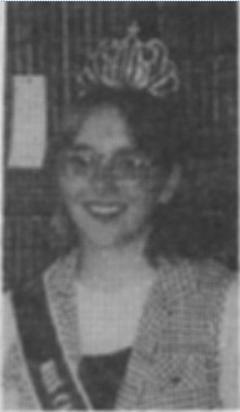 Heather is the twenty year old daughter of Robert and Daria Heck and the sister of Jennifer and Matthew Heck of Johnstown. A 2005 graduate of Greater Johnstown High School, Heather is currently attending Indiana University of Pennsylvania to pursue a degree in Accounting. 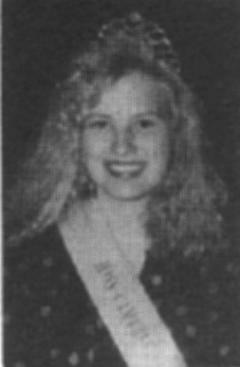 While in high school, Heather was a member of the National Honor Society, the National Technical Honor Society, the Spanish National Honor Society, Leadership Plus, a Junior and Senior Class Representative, Trojan Fan Club, The National and Pennsylvania High School Rodeo Association and Who's Who Among American High School Students. Heather has been involved with 4-H horse and swine clubs. 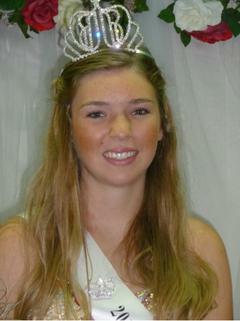 She is a leader of a 4-H Horse and Pony club and enjoys giving horseback riding lessons. 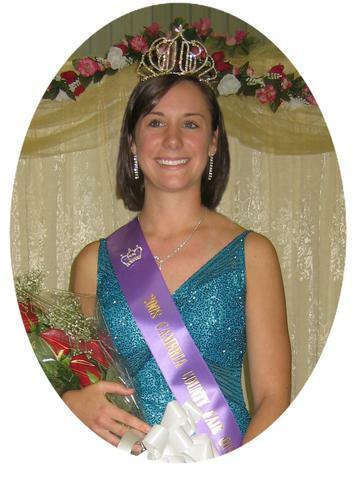 In 2006 she won Fair Queen Contest to represent the Cambria County Fair during its proud 115th year celebration. 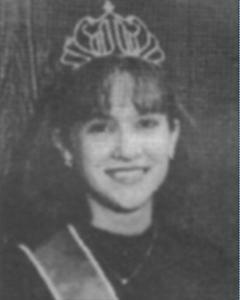 Beth is a 2006 graduate of Cambria Heights High School where she was active in the Marching Band, Student Council, S.A.D.D., Agriculture Club and a Walk-A-Thon Volunteer. 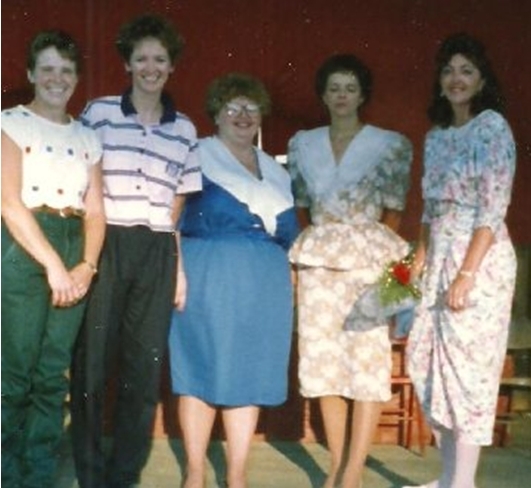 She is also a 4-H officer & member, Program Advisory Committee & 4-H Horse Camp Coun­selor. 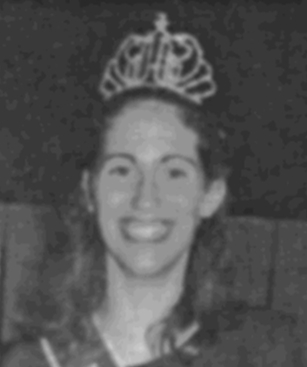 Lisa attends Central Cambria High School. 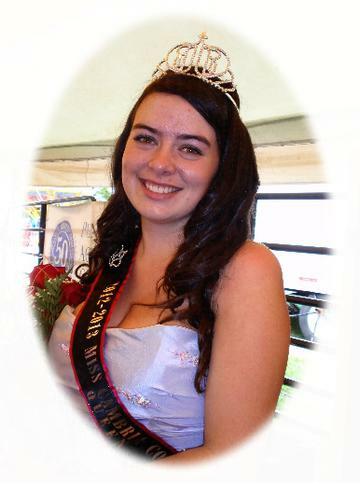 She is an active member of the Blacklick Valley Community 4-H, student congress, 2002 Cambria County Fair Princess, Sr. 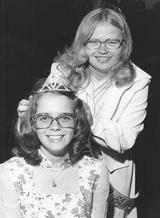 Girl Scout: Gold Award, Band, Chorus, Forensics, Manager of Wendy's, Altar Server at Holy Name, Member of St. Benedict Church. 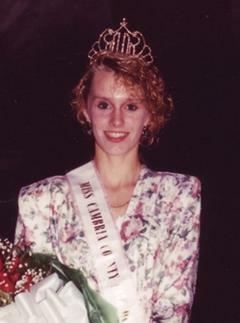 Nicole attends Cambria Heights High School. 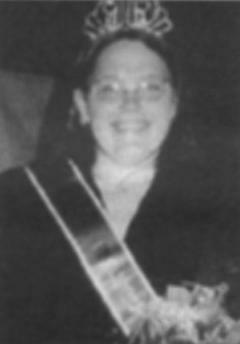 She is active in 4-H as a member in the horse and swine club, Penn State Ag Club, High School National Honor Society, Concert band, stage band, book club, member of St. Augustine Church. 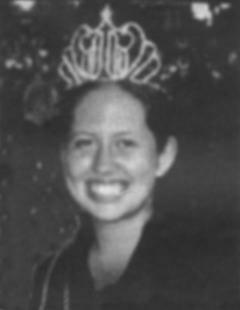 Virginia attends Forest Hills High School. She is a member of Ragers Corner 4H Horse Club, 4-H Ambassador, member of 4-H exchange club, SADD, Humanitarian club, Drama Club, Video production club, Holy Spirit Youth group. Erin attends Laurel Valley High School. She is a member of the Blacklick Valley Community 4-H Club. She is the daughter of Greg and Holly Galardy of Seward. Jessica attends Richland High School. 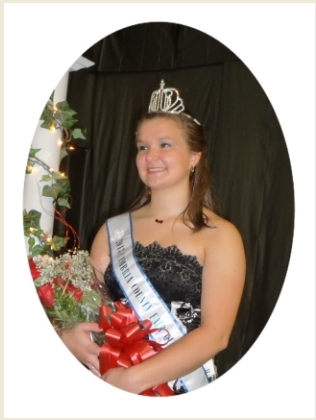 She is a member of the Cambria County Baby Beef Club, Rager's Hill 4-H Rabbit Club and member of Mu alpha Theta. Kristy attends Forest Hills High School. Her activities Include: Cambria County 4-H Baby Beef Club, Vice President & Teen Leader of the Rogers Corner 4-H Club, Secretary of the Cambria County 4-H Program Advisory Committee, Member of the 4-H Livestock Committee, Volunteer for Best of Friends Handicapped Horseback Riding, Member of St. John Gaulbert Cathedral Church - Youth Activities & Flute & Piccolo Soloist with Choir, Concert, Marching & Jazz Bands, County, District & Regional Band Honors, Band President, Forensics, SADD, Interscholastic Reading Competition, Chorus, Track & Humanitarian Club, National Honor Society, Who's Who Among American High School Students, Cambria County Junior Miss Finalist, Creative & Performing Arts Award Winner. 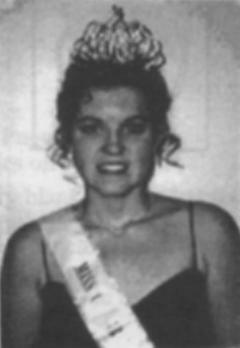 Jessica is from Ebensburg, PA. She graduated from Cambria Heights High School. 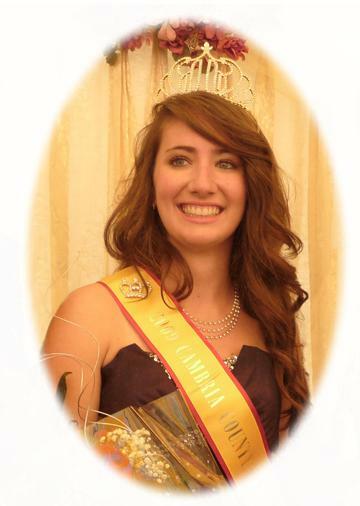 Her activities include: Banner Grange Member, Wilderness Hollow 4-H Member. Student Council, Theatre Club, Fall Play, Foreign Travel Club, Wrestling Matmaid, Spring Musical, and Who’s Who. Kristina is from Nanty Glo. She attends Indiana University of Pennsylvania. Activities Include: Track & Field, Vice-President 4-H Horse Club, Who's Who Among American High School Students and Basketball.